Welcome back to my old comrades, go ahead and do your stuff and for the new members on here - it's simple, just add your most wittiest caption to the above picture. "Fantastic AR glasses, Q... it's like they're really there..."
Quoting Nid: "Fantastic AR glasses, Q... it's like they're really there..."
Good to see you Nids, many thanks for entering. "My god, she was that ugly, i've gone blind." "Not only has poor Daniel Craig gone blind, but he is also missing his walking stick named Camille." Bumping in case some posters do not realize this thread has been resurrected. Why do we have two threads on the same topic? Which one should we use from now on? I feel stupid, sorry all. Thanks for clearing that up @danslittlefinger. Quoting Samuel001: I feel stupid, sorry all. I'd be honoured if you would choose to enter both competitions. Quoting Samuel001: "After going to other Bond forums, Bond himself had been blinded some strange colour choices. He knew where to stay"
"So THAT'S where all the Star Trek thread photos went... Hey muppet, give me that camera!" After filming CR, Craig was determined the next film should be a remake of Dr. No, here he is trying to do the "three blind mice" scene. He could not, however, convince two other members of the crew to join him. Thanks for entering chaps. Nice to see you back. Howzabout giving the CatCapCon a bash too - bit thin on the ground there. At long last Craig finds where Brosnan had parked the invisible Aston Vanquish! "so that was the boy that stole my camera.Now i am going to catch you"
After viewing the Bond and Mayday love scene from AVTAK, Dan Craig leaves blinded by the experience. A deleted scene from QOS in which Bond has just seen M naked. Has devastating effects. Many thanks to everyone who's entered, the old comrades as well as new. Everyone's a winner here as you took the time to enter. :> Can't say that's ever happened to me but I rarely wear sunglasses. Quoting saunders: At long last Craig finds where Brosnan had parked the invisible Aston Vanquish! :-)) I have the same problem when I come out of the shops, bloody car. Never in the same place twice. Look forward to your Bond pic! hahahah this is just imposible to guess. 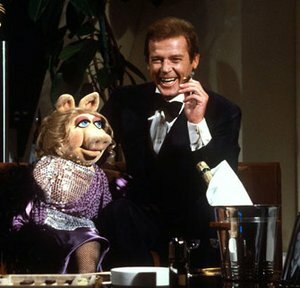 Roger Moore struggles to maintain composure as Jim Henson's hand finds its way up the wrong backside. "What would it take for you to see things my way, Piggy Galore?" "Roger always enjoyed a juicy pork". hand finds its way up the wrong backside. Well done H007MER, over to you.